Think farmed salmon doesn’t taste good? Wrong! 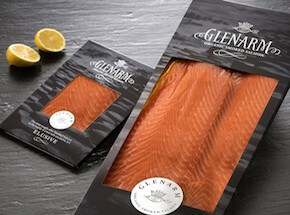 Glenarm Organic Salmon swim in offshore farms exposed to the clean, clear and fast moving coastal waters of the Irish Sea. The currents and tidal flows means these silver-skinned beauties have to work hard. That means they have firm muscles and the flesh is a joy to eat. Chefs just can’t get enough of it. The salmon have plenty of space to grow and thrive with maximum stocking densities of 10kg per cubic meter, minimising environmental impact and providing the salmon population with a living environment that reduces stress and promotes healthy growth and freedom to thrive. The fish behave as naturally as possible. They look after their stock here. They don’t get parasites or diseases so they don’t need medicines and antibiotics. This is as close to wild salmon as you can get but with more consistency in texture, shape, size and flavour.